I have read and enjoyed several comic books over the past couple of months, but I don't have a ton to say about any of them, so I thought I'd pull them all together for a post before the end of the year. After reading Chicken with Plums, I think I am caught up with Marjane Satrapi's work. While I haven't enjoyed any of her other books the way I enjoyed Persepolis, I found a lot of heart in Chicken with Plums. 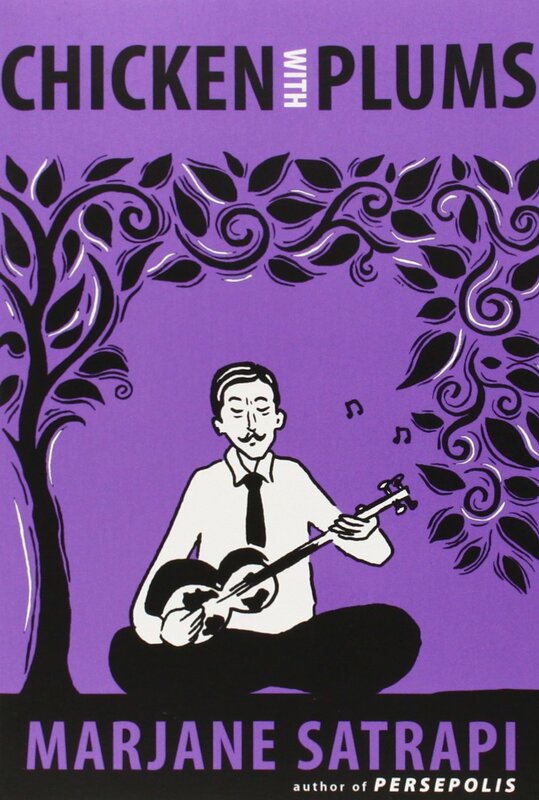 The book is about Satrapi's uncle, a musician who died before she was born. She shares his story through flashbacks as he lies dying. The book showcases some of Satrapi's great talents - her ability to create empathy for characters that are not very likable, her skill in bringing mid-to-late 20th century Iran to life, and the way she can draw a panel that vividly comes to life. It's very possible that I liked this story mostly for one unforgettable panel of the main character's son praying fervently in the night for his father's life, even though his father continuously berates him. Noelle Stevenson's Lumberjanes is completely different in scope and feel. It focuses on a group of camp girls who strive to be amazingly self-sufficient. It's a really fun and a great way to showcase women as strong and witty and awesome. None of the girls feels jealous of any of the others. There is no drama. There is just friendship and fighting and hilarity. It's hard not to enjoy the adventures, even though now that it's been a little while since I've read the book, I remember very little about it, plot-wise. But still! Fun counts for a lot, and I will definitely continue with the series. 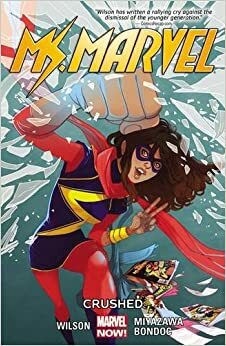 Volume 3 of the Ms Marvel series was not quite as enjoyable to me as the first two. Most of my complaints around G. Willow Wilson's writing (in both comics and novels) center on her heavy-handedness in talking about religion and immigrant life in her books. The racism and religion thing becomes even more prominent in this issue, and while I truly appreciate her effort to teach people about other cultures and to diversify the Marvel universe, it can get a bit trying after a while. Lumberjanes is clearly a feminist work even though there is no overt, hit-you-over-the-head feminism in its pages. I just wish that Wilson would employ a more subtle technique once in a while, too. And then I FINALLY read one of the most famous graphic novels of all, Art Spiegelman's Maus. Maus alternates between New York in the 1990s and eastern Europe during WWII. Spiegelman's father is the star, in all his ornery, complicated glory, as a man who survives war and concentration camps through ingenuity and frugality, but whose experience ultimately makes it very difficult for him to live a normal life anywhere, even decades later. I don't really enjoy fiction set during WWII, and I have a conflicting set of feelings in which I don't think we should ever forget what happened, but at the same time don't want us to keep memorializing the past while we blatantly ignore the human rights issues happening right now. That's part of the reason it took me so long to read Maus. But I think this collection is about so much more than the Holocaust (though, obviously, that is a huge topic to tackle). It's more about how experiences can shape us and reverberate through our lives, and our children's lives, and so much else. So much of Spiegelman's life was shaped by events that he didn't really know, by people he never met. And I loved the respect he gave to those events and people, and the way he highlighted the way those events impacted his own relationship with his father. It was so well done. I don't think I'll really want to revisit it, either. I agree we read a ton of Holocaust books in school growing up, and I think I've had my fill. Yes yes yes, I totally agree re: Holocaust fiction & WWII fiction in general (but specifically set in Europe). I also agree about Maus. It is a wonder. Yes, there is a LOT of Holocaust fiction and WWII fiction set on the British home front. And probably France. It is tiring. That said, very glad I finally read Maus. I realize that I have missed a Satrapi book, too - The Sigh. I am so surprised you haven't read MAUS before now! I am glad you liked it. Did you see the comic out called BOMBSHELLS? It is centred around female superheroes and set in an alternate WWII. I am going to check out the trade when it is released next year. I totally get what you're saying about Ms Marvel, although I continue to mostly love it. I think the heavy-handedness is more forgiveable in a book pitched to younger readers because although young readers don't necessarily require that heavy-handedness to understand her points, Wilson sometimes gives them a good vocabulary for stating their views. I can appreciate that. It probably helps, too, that I read Ms Marvel an issue at a time, and don't see so many unsubtle bits at one time. Yes, you make a fair point about this book targeting younger readers. But she does it in her novels, too! And I DO appreciate the effort, really, I just wish she didn't feel the need to lecture quite so often. I'm behind on Ms Marvel--did like the first one quite a bit but just haven't picked up the second. Eventually. I think Embroideries is my favorite Marjane Satrapi graphic novel. I am so fascinated by the world she recreates there and the ways that gossip works. Glad you're blogging again, btw. I also enjoyed Embroideries more than a lot of other people did! I thought the way she illustrated it was excellent, and I agree, the gossip was just a lot of fun. It made me think of Iranian women in a totally different (and way less repressed) way than I usually do. Yes, so many amazing ones! Maus is just epic, I loved studying it! Persepolis remains my favorite Satrapi, too, though this one and Embroideries was really great as well. Lumberjanes was just ones of the best things I read this year, can't wait to read the next issue (I'm at #5 currently). Really want to read Ms Marvel, I think I'll just have to buy the single issues.